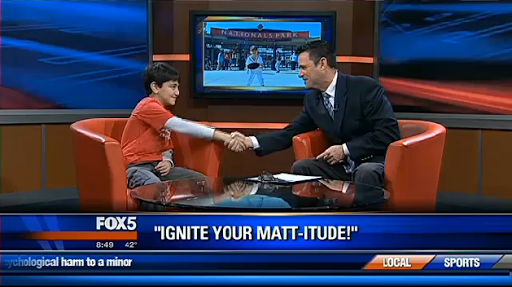 Yesterday, February 27, Matt’s Bats was on FOX 5 News Washington D.C. 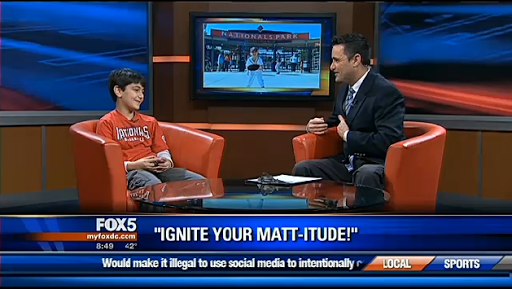 It was so fun going into the studio and sitting the big red chair with the microphone hanging from my Matt’s Bats shirt. 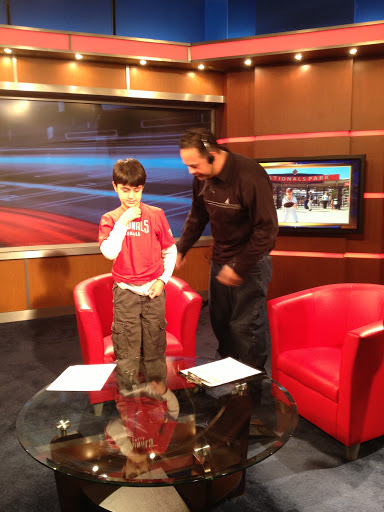 What 8 year old boy or girl doesn’t want to be on TV?! I didn’t know about the Cindy Brady thing, and my parents said I couldn’t watch the video until after my interview. When I got into the car to drive to the studio, I said “It all starts…RIGHT NOW!” When we drove down Wisconsin Avenue, though, I had the most butterflies in my stomach than ever. I was so nerve-cited (it means nervous and excited at the same time)! I stepped up into the prop room behind the Studio B. Suddenly, I felt so much better! That was because I saw there was a comfortable couch and a TV in the green room so you could watch FOX 5 WTTG while you were waiting. I had watched Dave Ross earlier on the air. It looked so easy to be interviewed. Also, another cool part of me being in the green room is that I met some of the Redskins cheerleaders. I took a picture with them. After that, Dave came in to talk with me a little bit. We talked a little bit about baseball and the Nationals and my website. A few minutes later, he brought me into the studio. They asked me to slip a microphone up my shirt and clip it on. It was the commercial break before Dave and I went on the air. I sat down in the big, red, comfy, chair. The director said on “On in 30!” It was all happening so fast. I got nervous for a second and asked “Does that mean we are starting in 30 seconds?” Dave said, “it’s just you and me in the room.” The director said “5….4…3….” Then, the white words on the TV screen under the cameras started moving. Allison Seymour and Tony Perkins talked. They introduced Dave, who started talking about me. 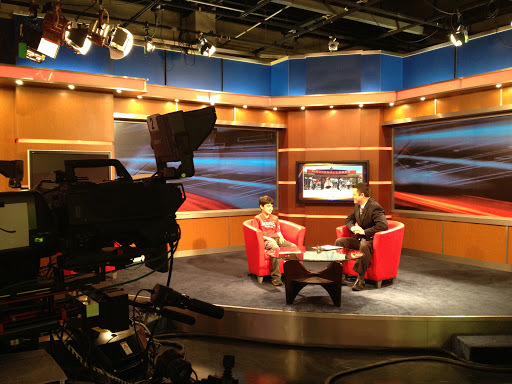 I saw myself on TV for the first time and a big, bright smile came on my face that lit up the DC area. Who wouldn’t! I was on live TV! Dave talked with me for about 2 minutes in the green room before I went on the air, but he didn’t tell me what questions he was going to ask me. So I had to think of answers off the top of my head. 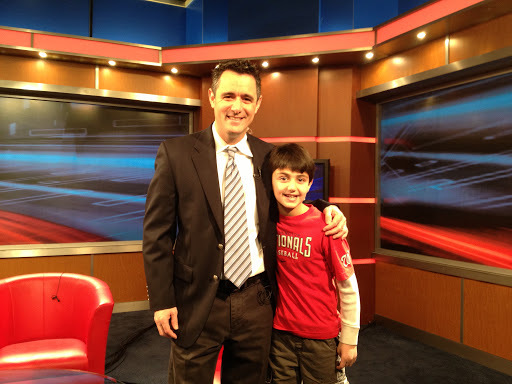 At one point, he asked me ” How many people subscribe to your blog?” I answered “Only 7” But I MISUNDERSTOOD HIM! I thought he was talking about subscribing by email, which only 7 people do. (If you want to get a daily email, click on the Subscribe tab on the right hand of the homepage). But hundreds of people follow me on Twitter, and I love all of my fans and followers. 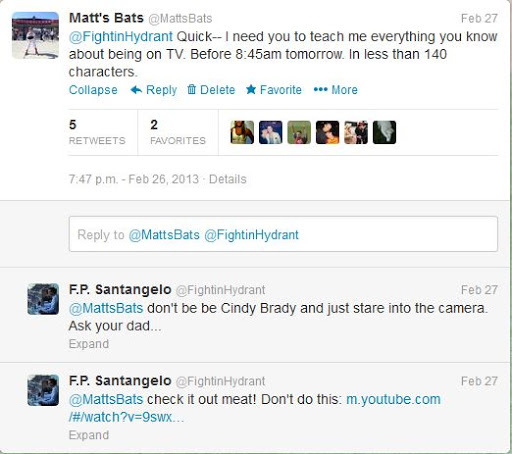 In fact, MattsBats.com has about 15,000 views since I started it in July 2012 and most posts get about 100 views or more a day. (My most popular post, the NatsFest Recap has about 1,000!). After the show aired, I went from about 415 followers to about 450. I am still as excited about that as when I got my first #FFs from the awesome Nats fans on twitter! (See the video HERE). Dave also asked me who my favorite player is. I said Gio Gonzalez because he is both a great pitched (nasty hook, Cy Young contender, and 21 wins, most in MLB last year) and he has a lot of fun on the field and in the clubhouse pouring Gatorade on people. But I love all the Nats players. Especially the ones with Matt-itude! Here are some photos from the clip on air itself. I love them so much!! The reaction I have been getting from fans on Twitter has been awesome! Thank you guys so much for your support to help me get to this big day. I am so ready to go on TV again because next time I won’t be as nervous and I will totally rock my Matt-itude! Awesome post, Matt! I'm so proud of you! Congratulations, Matt. I read about you in the comments on another blog that I follow, so I watched the television interview online last night. It was great! You seemed very much at ease on camera. Congrats! We should show a clip in PE!